Born in Kelantan, Malaysia, Aini Ideris graduated with a Doctor of Veterinary Medicine degree (1979) from Universiti Pertanian Malaysia (UPM), currently known as Universiti Putra Malaysia, a MVSc in Avian Medicine (1981) from the University of Liverpool, England, and a PhD in Avian Medicine (1989) from UPM. She continued with post-doctoral training at the University of California, Davis, (1990-1992), and at Cornell University, USA (1993), under an Asian Development Bank Fellowship. Aini’s research interest is in avian respiratory and immunosuppressive diseases. Her research has led to the development and commercialisation of Newcastle disease, fowl pox and infectious bursal disease vaccines. These vaccines are being sold in more than 8 countries. Aini plays an important role in poultry health education, training and research, aiding the advancement of the poultry industry in Malaysia, improving the health of village chickens, and mentoring many Malaysian avian veterinarians. In recognition of her scientific contributions, Aini was elected Fellow of the Islamic World Academy of Sciences, Fellow of the Academy of Sciences Malaysia, Founding Fellow of the Malaysian College of Veterinary Specialists, and Fellow of the Malaysian Scientific Association. She is also a Council Member of the Malaysian College of Veterinary Specialists and a Board Member of the Malaysian Cancer Research Institute. Among the awards received by Aini are: Research Innovation Award 2008 as co-researcher, and the National Academia Award (AAN) 2010, (category Innovation and Commercialisation of Products). AAN is the highest achievement award conferred to Malaysian academics. Aini started her career as a tutor in UPM (1979), becoming lecturer (1981), Associate Professor (1991) and Professor (1996). She was the Acting Head, Department of Veterinary Clinical Studies, in 1989 and 1990, Chairman of Veterinary Teaching Hospital (1992-1998), Deputy Dean, Faculty of Veterinary Medicine (1992-2001), Dean, School of Graduate Studies (May 2001 to November 2008), and Chairman of the Malaysian Postgraduate Deans Council (2005-2008). 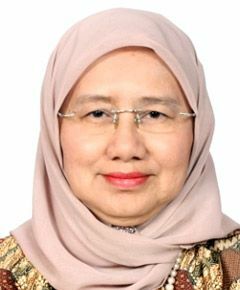 Currently, she is the Deputy Vice Chancellor (Academic and International), UPM (since December 2008), and Chairman of the Malaysian Deputy Vice-Chancellors’ Council (Academic and International). Aini is married to Dr Md Ishak Ismail and they have 4 boys and a girl.